Directional signs will not be posted for the first two events on Wednesday and Thursday; please print the driving directions below. For all events, please park as directed by the parking marshals or signs. Only pull off far enough to be clear of the main roadway. Distance from parking to the start: 200 meters southwest from intersection of Roads 701 and 701B. This race will be mass started with the start going off promptly at 4:00 pm. Plan to arrive at the Start location about 10 minutes early for a briefing and map handout. We are planning to use an epunch control at the Finish for race timing (this is different from our past races), and pin punching at the course controls. If these plans change for some reason, there will be a notice at check-in. Otherwise, you should have both your epunch and a punch card with you at the Start (get a punch card at check-in, and write your name on it), and wearing your bib number if these are being passed out. You will need to clear and check your epunch before the Start, and you will need to epunch at the Finish control, download, and hand in your punch card just past the Finish. The terrain is bland spur/gully granite with very little rock and vegetation consisting mostly of open, short grass prairie with only small amounts of sage, broken up by thin pieces of aspen/pine forest occupying some of the reentrant systems. Visibility is mostly excellent with often very long lines of sight. Runnability is excellent with only several small areas with some amounts of ground juniper, depending on routes taken. For fence hoppers, there is one fence that will be crossed several times with nice hopping chances. For everyone else, there is one fence that you will have to get through one way or another several times. There is one short section of downed fence to be alert for right after one control; it will be marked with streamers. There is also a small area of some metal debris (mostly very old, flattened artillery round casings) right before the last control, and even though it doesn’t appear there are any dangerous objects there, it would be smart to be aware of where you are stepping there. The course is 7.7 kms. For those who don’t want to run that far, there are many opportunities to take short cuts, but results will be based on completion of the full course. For controls visited more than once, you should punch each time, in the correct box. The map (a portion of the Lights of Cheyenne map) will be printed at 1:10,000 with 5m contours, and was last revised in 2006. The map remains in quite good shape with the only changes worth noting being there are areas of white forest that have suffered some amounts of beetle kill; you will almost certainly encounter several small areas of deadfall along the course. Overall, it is pretty straight-forward orienteering, on the easy side, and yet, as always, there are places to go astray if you drop your concentration, or run so hard that you start to go fuzzy in the head. I ran a version of this course last year for training, and it was enough fun that my immediate thought was that it would work well for this event. I made some changes, have run it several times, have thought it was fun each time, and hopefully you will think it is fun, too. Driving Directions: From I-80 Exit 323 (the Visitor’s Center exit), take WY 210 (aka Happy Jack Rd) east for about 2.8 miles and turn left onto Forest Service road 712. Follow 712 for about 2.1 miles to a T-intersection, turn right, and continue 0.3 miles to the next intersection, and continue straight onto 701. Follow 701 about 0.7 miles to the intersection with 701B (you will pass the race Finish along the way). Turn left onto 701B and park, pulling just far enough off the road to leave the road clear and being careful to avoid flammable high grasses. From the intersection of 701 and 701B, the Start is about 200m to the SW, approximately at the wood line. Distance from parking to the start: 200 meters. This race will be mass started with the start going off promptly at 10:00 am. Runners should plan to arrive in plenty of time before the race to collect a punch card at check-in and write your name on it, and collect a map packet. The One Cowboy Relay will consist of five loops total, with the first four loops taken in different order by different runners (motala style), and a final loop that will be common to all. There will be a designated map exchange area where runners will place their map packet on the ground -- map side down -- and secure it with a rock or water bottle or some other object that will keep the map packet from blowing away (runner responsibility to bring the rock or whatever they are going to use). Runners will not look at their maps. We are planning to use an epunch control at the Finish for race timing (this is different from our past races), and pin punching at the course controls. You will clear and check your epunch before the start, and you will punch one time at the Finish as you complete the final loop (you will not punch the Finish control after the first four loops), then download and hand in your punch card just past the Finish. Maps will be printed at 1:10,000 scale with 5m contours. The first four loops will take place on a section of the existing Rattlesnake Hill map, which has been very lightly revised. The forested portion of the map you will run through was burned a year ago; many of the trees died but nearly all remain standing and the overall effect as far as orienteering goes is that both visibility and runnability in that area are very good. The final loop will take runners on a piece of new map that has never been used before, with the survey completed several years ago. There is one old burn area that was white forest when the map was surveyed but which has considerably "greened up" with new aspen growth; runners may come near this area depending on route choice, but no logical route choice would mean going through this now-green area. The terrain consists of moderately hilly, granite terrain with moderate rock detail and some small sections with higher amounts of rock features. The area is mostly open prairie with both areas of fast grass and also areas with significant amounts of sage and bitterbrush with generally good running. There are scattered trees and also sections of open pine forest as well as several narrower, finger-like areas of aspen forest occupying some of the deeper side valleys. The area is almost path-free and there are no fences. There will be prizes for the top finishers, with the number of prizes to be awarded depending mostly on how nicely racers treat the course setter prior to, and during, the race. Driving Directions: From I-80 Exit 323 (the Visitor’s Center exit), take WY 210 (aka Happy Jack Rd) east for about 2.8 miles and turn left onto Forest Service road 712. Follow 712 for 2.1 miles to a T-intersection, turn left onto 702, and continue for about one mile to the intersection with 714*. Turn right onto 714 and begin parking along the right side of the road (do not park anywhere in the several places where the road narrows and where it would be difficult for other vehicles to pass). Several hundred meters past the intersection of 702 and 714, the road widens generally and passes out of the forested area, and it begins to be possible to pull off the road entirely. *The Start/Finish area will be on the right / east side of 702 in a flattish clearing area just before the intersection with 714; do not park there or anywhere along 702. Map: Granite Planite (1:7,500, 5m contours) new map! Distance from parking to the start: ~700 meters (follow road 700R east). Granite Planite is a brand new map, surveyed this summer by Mikell Platt from an older (and not so great quality) photogrammetric basemap supplemented with high quality imagery from Google Map, with 5 m contours, and printed from ink jet at 1:7500. 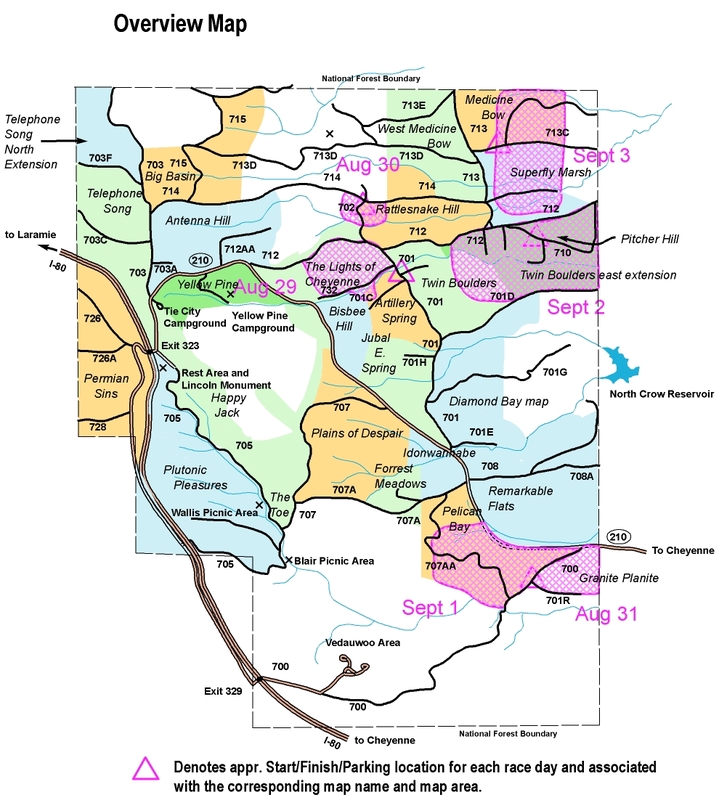 The mapping standard generally conforms with the prevailing standards used for all of our Laramie Range maps, though with several differences: 1) some smaller rockfaces on dot knolls have been mapped in cases where they seemed especially prominent to the eye, 2) some rather small dot knolls with heights under 1m have been mapped, 3) some very small patches of bare rock have been mapped, and 4) and most significantly, areas of beetle kill dead fall have been mapped, using the "good visibility, walk" symbol (tight green lines). In most cases, this symbol has been overlain with the "rough semi open" symbol as well. The areas of fallen trees vary considerably in terms of how difficult they are to get through, but generally they are worth avoiding. The edges are vague and mostly not reliable for very fine navigation purposes. Some parts of the map are extremely detailed with a wide variety of types and sizes of rock features. Nearly all dot knolls are rocky in nature and nearly all have been mapped with a small area of bare rock on top of them -- though the bare rock may be difficult to make out because in most cases the bare rock will extend only slightly beyond the brown dot or oblong shape. The terrain is mostly rolling to flattish, with only one larger, steeper slope that most courses will not cross. The area is mostly prairie with scattered pine trees and varying amounts of sage and bitterbrush underneath, with some larger areas included of wide open short grass prairie, as well as areas of open pine forest. There are also several fingers of aspen, which are visually prominent as "green" and which correspond almost exactly to the green on the map. Nearly all of the aspen areas have been mapped as "slow run" but in fact the runnability varies considerably and in some places is much worse than the color implies. Most of the aspen areas could also be mapped as "marshy forest", depending on time of year and how wet the season has been, but have not been mapped as such for this event. Generally speaking, both runnability and visibility are very good to excellent, and aside from areas of fallen trees, there is little to impede progress along the courses as set. The advanced courses will traverse several different areas or types of terrain/forest with distinct character and very appreciable differences. From the Start, runners will follow a flagged route to a common first control. Note that beyond the Start, road 700R and areas along both sides of the road are out of bounds. From the first control, White and Yellow runners will have a streamered trail marked on their map, stretching all the way to nearly the Finish. The trail is marked, and will exist, in the form of pink streamering and/or pin flags in the terrain. Other courses will not have the trail marked on their maps. Runners may visit the same control multiple times, and should punch each time, and should be careful to follow the correct line to the next control in order. There are almost no controls which are not close or very close to other controls, though close controls will be on dissimilar features (there is one pair of controls where the dissimilarity is in the form of the size of the control features.) Given the open nature of the terrain, it will be easy to spot controls other than the one you need to spot! Check control codes when in doubt and check control codes even when not in doubt. Then check once again, just to be sure. Hopefully runners will find these courses both challenging and fun. The challenge will come mostly in the form of maintaining focus and efficiency through a large number of controls, adapting to the terrain changes, and minimizing small time losses -- which will add up quickly if you're sloppy in your technique. The course setting is deliberately different in style from what might be considered a more typical middle distance type course, and a principle aim is to offer runners a very different experience from any of the other days of the Rocky Mountain Orienteering Festival. The most northern part of the map is quite popular with shooters and unfortunately they have left behind some amount of trash and debris. Runners should be alert to the possibility of broken glass on the ground and other potentially dangerous objects. Driving Directions: From I-80 Exit 323 (the Visitor’s Center exit), take WY 210 (aka Happy Jack Rd) east for about 11.1 miles. Turn right onto Forest Service Road 700, and continue on 700 for 0.8 miles to the junction with 700R. Turn left onto 700R and begin parking past the short wooden fences, in the open spaces on either side of the road. Please do not park along 700R *past* the intersection with 700RA; parking anywhere along 700RA is fine. Yesterday's courses are the area next door, so you should have a good idea what you are in for today: a lot of rock, with runnable bits in between. White and Yellow will have some taped legs. All courses will cross barbed wire fences. There will be pool noodles on crossings affecting the White and Yellow courses, as well as the Start and Finish controls, but be careful. Controls on the fence can punched from either side of the fence. Unfortunately there is deadfall affecting the runnability in some areas. This does not affect White or Yellow, and I have tried to limit the impact on Orange and Brown. The Blue course will be printed in two sections, on separate sheets of paper, both of which will be placed in the same map case back-to-back. At the end of the first section, Blue runners will do a map flip and then continue on the second section until they have completed the course. 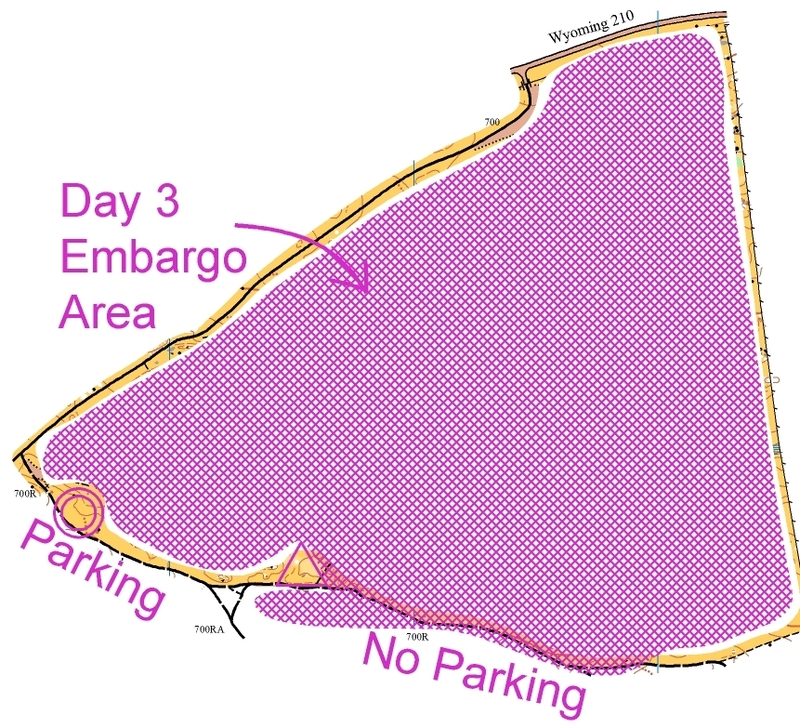 Distance from parking to the start: ~100 meters (just southeast of the east end of the parking area). 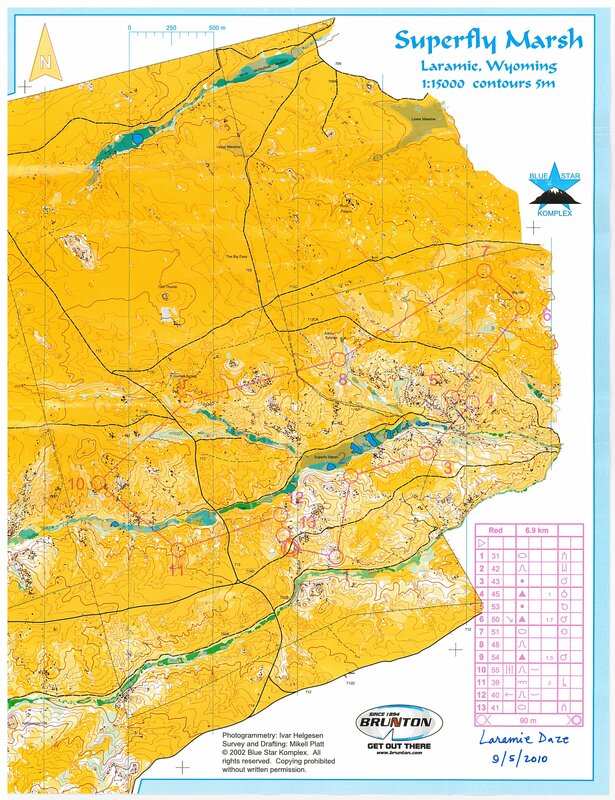 This map offers a good mix of open fast running, dense sage, scattered trees, forested area, and rocky areas. Cattle and mule deer have been periodically sighted. Overall the map is excellent and accurate, though it is not impossible to find the occasional rock feature or tree that has not been mapped; but there are so many features to navigate by, such details should be inconsequential. Cow paths occur in spots and are likely not mapped, except one that was used in a mountain bike race a few years back; its mapping has been updated in spots. Recently fallen trees occur in a few areas mapped as white; these areas are limited and can slow navigation, but the areas are not very extensive. Many solitary trees are mapped as a small patch of white on the map, while a few are mapped with a tree symbol. Some of these solitary trees have recently fallen as well. Most light green areas are aspen groves, but not all, and vice versa. Marsh areas are on the dry side, but it is still possible to get wet feet. All courses except White will have stream crossings, which for some can be done with one leap, others will have to step down an approximate 2-foot bank and get a foot wet and step up the other bank. No fence crossings are required for any course. All courses have a common first control. White has one flagged leg. Campers are possible anywhere along any road; this may be an issue for one Red and Blue road crossing. If you see tents / campers / cars next to a road, please navigate around them by a reasonable amount. The leg in question does have some route choice, and I tried to plan for that road crossing to be away from the well-used camp sites, but new camp sites can be established anywhere at any time along roads. ATV traffic may be heavy along any road as well. Driving Directions: From I-80 Exit 323 (the Visitor’s Center exit), take WY 210 (aka Happy Jack Rd) east for about 2.8 miles and turn left onto Forest Service road 712. Follow 712 for 2.1 miles to a T-intersection and turn right. Continue on 712 for 0.3 miles and turn left at the next intersection. Follow 712 for 1.8 miles to a four-way intersection and continue straight on 712 for another 0.4 miles to the intersection of 712 and 710. Veer right onto 710 (don't take the sharp right going downhill) and continue about 0.4 miles on 710, parking behind any already parked cars. Please do not park any closer than 150m to the junction of 710 and 710A (now shut off and marked by a short wooden fence.) Start will be in the vicinity of the junction of 710 and 710A (approximately 125 m from the junction). Note that several numbered road signs may be missing along the way. After parking, please do not venture south or east as this is right in the Start / Finish competition area. Warmup can be done along Road 712. Distance from parking to the start: ~200-300 meters (walk east along road 713C until you see sign for start). This sunny venue offers a variety of wide-open grassy ranges, steep & rocky slopes, marshy low points, and a few small aspen forests. There are areas of subtle terrain as well as steep and intricate bouldery areas with cliffs. Most of the course will be very runnable with few spots requiring significant slow-down. There are very few areas with poor visibility. Even the light green aspen forest areas are fairly runnable. One of the slowest areas for orienteers on this course will probably be the marsh crossings. If you choose to cross a marsh area, use caution with your footing. The marsh crossings can be very pothole-ridden. Hidden holes under the marsh brush can be quite deep after falling into them, speaking from experience. Beavers have built numerous dams and holed out a lot of the terrain in the marsh and stream areas. When setting the course I stumbled upon hummingbirds, deer / antelope, and beavers. Weather and winds can change quickly in this area as they did the day I set the course, especially when cold, windy storms pass through. My day setting the course started sunny in the 80s and ended with numb hands from a high winds with a wind chill and sleet. Because vegetation is so sparse in this area there are some locations where an individual tree may be mapped as a white open forest area. Water and marshy areas were updated in the latest revision to this map but the water levels and layout of the ponds, marshes, and streams can change drastically based on presence or absence of rainfall in the area. This was my first time course setting a national-level event so I hope it turns out to be an enjoyable, challenging, and up-to-spec course despite my shortcomings. Driving Directions: From I-80 Exit 323 (the Visitor’s Center exit), take WY 210 (aka Happy Jack Rd) east for about 2.8 miles and turn left onto Forest Service road 712. Follow 712 for 2.1 miles to a T-intersection and turn right. Continue on 712 for 0.3 miles and turn left at the next intersection. Follow 712 for 1.8 miles to a four-way intersection and turn left onto 714. Follow 714 north for about 1.6 miles (along the way 714 turns into 713), to the intersection with 713C. Turn right onto 713C, continue east for about 0.5 miles, and park. This spur road has several rougher spots near the end of this distance — not hard to get by if you take it slow — but you can also stop early and you will still be close to the start.